Why limit it to America. Why not begin the first Global Revolution? The actor Bob Basso is no doubt filled with passion, though I feel his interpretation of Thomas Paine is misguided. If he had actually read the works of Paine he might have stumbled across these CORE ENLIGHTENMENT BELIEFS outlined in The Rights of Man. Basso's anti-immigrant slant on Paine's character is highly contrary to Paine's belief that THE STATE HAS A DUTY TO HELP THE NEEDIEST OF ITS PEOPLE. For a man that once said "My country is the world and my religion is to do good" I find it hard to believe Paine would have agreed with all the points made here by Basso. In my mind the revolution Thomas Paine might align himself with in 2009 would be the movement for GLOBAL DEMOCRACY. Basso's Barking rhetoric in the video above echos the Ron Paul supporters that rallied around the free market philosophy so ardently for the past two years. This form of arch libertarianism leaves out many other key aspects of the bill of rights that all Americans need to reacquaint themselves with. Basso also seems to be unhappy with President Obama. I wonder if he knows how much academic respect Obama has for Paine. Having quoted Thomas Paine in is inaugural address I think Obama might actually listen to the more enlightened aspects of this rant, especially the call for service and sacrifice! Whenever evidence is presented for global climate change on a millennial time scale the method of choice seems to be polar ice. By measuring carbon dioxide in the tiny gas bubble captured in ice core strata from Antarctica researchers can generate graphs depicting earth's annual inhalation/exhalation of carbon dioxide for thousands of years. Al Gore famously displayed these results in an Inconvenient Truth while riding a hydraulic scissor lift next to his presentation showing how dramatically the green house gas levels have increased in recent years. The beauty of the scientific method lies in how knowledge emerges. Knowledge is further validated or overturned when new evidence is presented. In the case of global climate change I suggest listening to scientists over George Will. Researchers at the University of Arizona at Tucson recently published a paper brilliantly exhibiting an alternate method for measuring global temperature trends in the journal Nature Geoscience. By using a freshwater lake on an island in the Galápagos as a natural laboratory these researchers where able to use the paleogeologic record to measure sea surface temperature trends. For thousands of years the lake had been collecting data in the deposits near the shore all the while waiting to be unearthed by some curious researchers. The littoral zone in a fresh water lake consists of the shallow waters lining the perimeter. Unique microscopic communities live in this zone and differ from communities living in the deeper open water. When the clouds over the lake deliver more precipitation the lake gets deeper and the littoral zone shifts towards the shore. Think about looking down at a circular lake from above. If the littoral zone was colored it would look like the iris of a giant eye looking up at you. Warmer sea surface temperatures cause more rain and therefore the "iris" dilates while dryer times cause apparent constriction. As the creatures living in each zone die, dropping their remains to the lake bottom, they leave a series of horizontally stacked snapshots depicting the shifting littoral boundary. By taking cylindrical core samples from a lake depth in a fluctuating zone boundary and dating the strata the researchers were able to graph this dilation/contraction for two millenia. Their results show that there has been UNPRECEDENTED warming of the sea surface temperature in the equatorial pacific ocean for the past 50 years. This provides the world a way to observe global climate change at the equator as well as the poles and further validates the idea that the globe, on average, is warming. I recently heard a story in which a "human induced global warming" skeptic changed his mind as he watched for himself the shifting ecosystems near the arctic circle. I may be naive in thinking that piling on evidence in a case as monumentally important as climate change will redirect anyone's opinion, but I hope that logic works to persuade some global leaders before we have upwards of a billion climate refugees knocking on our doors. Many of you have seen this viral video in which the acting troupe Improv Everywhere stages a large scale theatrical "display" at grand central station by coordinating a motion freeze for five minutes. Recently a new group of Guerrillas have been spotted at central station in Antwerp, Belgium. Are there handicaps in the realm of evolving memes? What are they? Is the brain itself a handicap? Look at the amount of glucose it requires. One "fun fact" that has haunted me for years is this: the human body uses the equivalent of 160 grams of table sugar each day to maintain regular operation. Of this total the brain alone uses 130 grams. The brain bathes in metabolic energy. Why does the brain get all this attention if all we really need to do to pass on our genes is find a mate? Is the brain the human equivalent of the peacock's tail? PZ Myers writing about his expectations for the state of Florida brought Amatz Zahavi's handicap principle back to my frontal lobes. The first commenter on PZ's post predicted he would be attacked as sexist. Is the ability to sustain personal attacks part of the new phenomena of memetic evolution? Last night I watched a repeat broadcast of the PBS production entitled Judgment Day: Intelligent Design on Trial. As I listened to the great-great grandson of Charles Darwin - Matthew Chapman - speak about the creationist fiasco in Dover, PA, Christopher Hitchens immediately came running into my mind. During a recent pow-wow with the Four Horsemen Hitchens makes an argument that the others don't seem to agree with. He announces that he hopes the crazies on the other side of the God vs. Nature debate never go away completely, simply because he likes the exercise of debate. It is interesting that Richard Dawkins seems the most disturbed by this proposal. It is almost as if Hitchens is talking about the very thing none of them can acknowledge. Their fame and why they are famous. The fact that their presence there on camera, in best selling books, and in the social ooze of the internet is due to the conflict itself. The same wave of controversy Matthew Chapman is riding centuries after Darwin's birth. All this led me to thinking about Zahavi's principle in the context of memetic evolution and Darwin's family. Charles Darwin left a legacy when he published Origin. He not only reaped the rewards of the multi-platinum sales of his book but also left a nice fiscally padded red carpet into the future for his family to survive and thrive. While blogs are still in their adolescent phase when taken from the average global citizen's perspective, their role as incubators for cultural memes is becoming ever apparent. With the publication costs at essentially nil what is the rate limiting step to blogging and conquering blogdom? And if we are all supposed to be working feverishly to maintain those research grants, or keep the boss happy then how does PZ have the time to blog? How do I, and how are you reading this? Regardless if it is for sexual or intellectual selection "the Blog" represents a new handicap for cultural memeticists to muse over. Dr. Muney and Health Insurance? A New York doctor's “plan” to offer his services to the uninsured has come under fire from the New York State Insurance Department. Dr. John Muney offers his services for a flat rate of $79 per month with unlimited office visits, each at a $10 “co-pay.” The state of New York will maintain that this is too much like health insurance because it covers “unplanned” procedures. This situation offers plenty of material for debating the interpretation of the laws regarding health insurance. Read more on the story and the interesting debate that follows in the comments at this link. What is more important than interpreting laws? There at times, in my opinion this is one of them, when it is more important to debate the nature and purpose of laws, as well as their mere interpretation. Here a doctor has arrived at a feasible model to offer his services to a specific population of the uninsured and our laws stand to try and stop him!? To blame insurance companies or bureaucracy is too easy and doesn’t help anything. We must understand that our government, OUR LAWS, represent us, they are an extension of us! The national healthcare debate will heat up again in the near future when our current bout with cyclic economic strife moves into the rear view mirror yet again. Put simply, healthcare is not a simple issue. Transcending the limitations of bipartisan thought, moving thought beyond obsolete party lines, is essential to progression. My views, the views of many, can not be summed up with obsolete partisan politics. The complex issues/aspects of healthcare will have to be the subject of future posts. Here I want to echo, within the pages of Tom Paine's Ghost, the importance for all of us to give the issue of healthcare due thought from all perspectives. 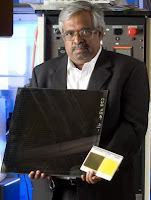 The president of Abound Solar met with president Obama this week. A company to keep an eye on, we have and will continue reporting on the emergence of Abound Solar. Read previous posts here and here. Temple Grandin spoke tonight about animals and autism. She spoke about animals we love and animals we eat. She outlined in very literal terms the science behind animal emotion; what gives animals fear, rage, anxiety, and joy. She details the research involved in illuminating the emotions of animals in a highly accessible manner in her book Animals Make us Human. As she spoke I could not help but be completely entranced by her electricity. Dr. Grandin is a professor of animal science at Colorado State University and she has Asperger's syndrome - a disorder that falls along the autism spectrum. She describes her brain as a corporate office building with Ethernet cords linking all the workers on the lower floors while upper managament is lucky if they get a dial-up connection. She smiles at the audience while her eyes maintain an intense stare. Her energy is contagious. She has been in the national spotlight before and her star will continue to rise this year with the release of a feature biographical film produced by HBO in which she is portrayed by Claire Danes. Professor Grandin is connected on a personal and professional level to some of the most challenging dilemmas facing society. Advocating early intervention and positive mentoring for children diagnosed with autism she stands as an example of a strong will overcoming hurdles. Her success as a best selling author gives hope to those afflicted with autism while her understanding of animals gives the world a better understanding of how to manage the growing meat industry while maintaining a consciousness of animal treatment. She is mentioned in two books that have influenced my life; The Omnivore's Dilemma by Michael Pollan and Autism's False Prophets by Paul Offit. Tonight she was asked her opinion of Offit's book and her answer was surprising. In Autism's False Prophets she is extolled as a champion for her role within the scientific establishment advocating early education and stimulation of children diagnosed with autism. She seemed shocked to learn that she was mentioned in the book and said she thinks the data indicating no correlation between vaccination and autism need to be scrutinized more thoroughly. She mentioned the error bars on a graph depicting the rise in autism presented at a recent seminar she attended at the Mount Sinai School of Medicine to be so large that they rendered the conclusions confusing. She basically said that more studies need to be done and the data needs to be interpreted by objective scientists not doctors or mothers filled with emotion. Throughout her talk she was filled with the qualities of a true scientist; a seeking drive to discover along with the skeptical eye on both sides of the issues before her. When asked about the legitimacy of industrial sized feed lots her answer was very practical. She said that large feedlots can either be managed well, in which case they are perfectly legitimate, or managed poorly in which case it is the personnel that need tweaking not the system. She did acknowledge that (especially in pig farming) biological systems are being pushed to extremes causing undue animal suffering. She has worked to minimize this suffering throughout her career and is credited with designing machinery that touches half of all beef sold in the United States. During her design process she visualizes step by step the individual cow as it moves through a system. Her photographic memory gives her this unique ability. I specifically asked her opinion on the role nutrition plays in animal behavior. Her response was equally as practical as her previous. She thinks nutrition plays a secondary role to the primary emotional effectors such as the social and physical environments. She specifically mentioned how well cattle do in the mild dry farms in Arizona because they do not have to cope with mud and over-heating they face in other parts of the country. Later she came back to the point about nutrition and mentioned that feeding a cow a lot of grain is like raising a kid on a diet of soda, cake, and candy. Of course the cow likes to eat the rich grain and is probably pleased, but the problem arises when the human manager tries to feed the animals too much grain. This causes lesions in the liver and obviously brings suffering to the animal. Her very practical remedy is not to shun the entire system, but to reform it; make sure the ratio of sweets to fiber is such that growth is maximized but balanced with health. She advocates providing oversight so that the greed of the meat grower does not ruin the system by poisoning the animals. The last point I will make was the first point Dr. Grandin made. She began her talk on the topic of animal emotions but quickly pointed out that half the people in the room would think the idea that animals have emotion at all is "B.S." She quickly began fighting these instant conclusions by talking about the specific structures in the brain where each core emotion is regulated and how these apply to animals and humans alike. Then she made a particularly pertinent point to the new emergent media in which you are reading this text. She proposed that the problem with scientific disciplines is a lack of cross-talk. The complete lack of communication between the realms of science is the reason neuroscience took 30 years to be applied to the study of animal emotion. When she made this point I thought of the new age of internet communication, twitter, facebook, etc. etc. and visions of open online laboratories swirled in my head. A world where an experiment in Shanghai could inspire the next day's experiments in Chicago simultaneously to their recording. A world where an autistic professor could transfer her excitement for knowledge through my fingers to your mind. The Pontificated Pinocchio pictured makes a particularly precise point. The caption reads "Condoms make the AIDS epidemic worse." 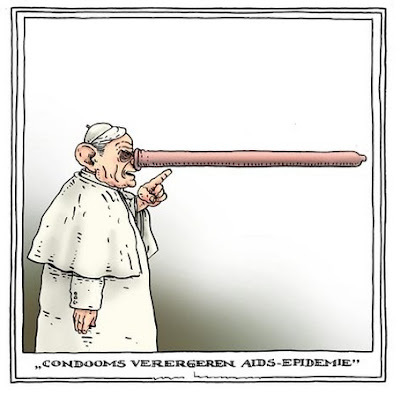 This cartoon originated in the progressive magazine Parool out of Amsterdam. It is worth noting that there have been NO death threats made on the lives of the artists involved. Religious insults are doled out on an equal opportunity platform in the western world. The Obamas have begun the ritual work of setting an example. This week Michelle, her daughters, and a group of local elementary school students pushed shovels into the dirt near the White House initiating what will hopefully become a flourishing vegetable garden. This is certainly not the fist time a garden has sprung up at 1600 Pennsylvania Ave. The above photograph is the White House circa 1910 where a maze of greenhouses provided the first family fresh fruits and vegetables in a time before refrigeration and the fossil fuel based agricultural system. The ground breaking of the presidential veggie garden took place in the south lawn (appropriately located to maximize sunlight) and marks a shift at the helm redirecting the food culture of the United States. The food philosopher Michael Pollan echoes Jamie Oliver as he outlines the importance of this shift in the following expert from an open letter to the president he authored last fall. "Changing the food culture must begin with our children, and it must begin in the schools. Nearly a half-century ago, President Kennedy announced a national initiative to improve the physical fitness of American children. He did it by elevating the importance of physical education, pressing states to make it a requirement in public schools. We need to bring the same commitment to "edible education" -- in Alice Waters's phrase -- by making lunch, in all its dimensions, a mandatory part of the curriculum. On the premise that eating well is a critically important life skill, we need to teach all primary-school students the basics of growing and cooking food and then enjoying it at shared meals." The entire letter is online here. By involving her daughters and children from the community Michelle Obama begins the process of developing social consciousness about food, nutrition, and stewardship. To read more about the history of food gardens at the white house visit Mother Jones. In today’s world, global climate change combined with unstable fuel prices due to the rising scarcity of oil has spurred a search for new and clean forms of energy. Plant derived fuels are an up and coming alternative energy source gaining attention. One such source is biodiesel generated by algae. Algae are being analyzed as a source of biofuel for several reasons. With the potential of 65,000 different species being used for this type of process as well as the possibility of creating highly efficient genetically modified strains, research into this area of alternative energy should continue. Perhaps the biggest reason it is so appealing is the ease of growth combined with the amount of fuel produced per acre. Compared to corn, which produces 18 gallons per acre per year, algae can produce an astounding 10,000 gallons per acre per year. Recently Valcent, a biofuel company in Texas, estimates that it can produce 100,000 gallons/acre/year using their closed-system Vertigro. The Vertigro system is particularly appealing because it is scalable. By calculating how much fuel is used over the country we could create production plants to produce certain amounts of biodiesel according to location. By strategically locating new production plants we enable ourselves to decrease the costs of transportation and create new jobs around the country. It may be argued that many in the United States are not using diesel engines currently but I argue that we should switch to diesel engines by slowly integrating more into our society. Diesel engines are more efficient and last longer than conventional engines. Europe has already begun integrating vehicles with diesel engines. To compensate for the lag in infrastructure in the U.S. biodiesel can be used into today's vehicles by using blends of regular diesel and biodiesel. The use of blends initially is appealing because over time we can slowly incorporate more biodiesel into the blends until we use pure biodiesel in our engines. 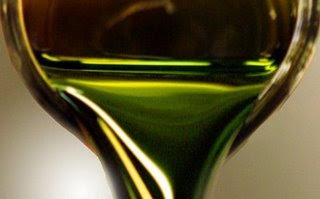 Biodiesel derived from algae looks like a viable solution to our oil addiction. I do not think this is the only answer to our problems but it has potential to help us shift away from fossil fuel. Do you think biodiesel derived from algae is part of the answer? We are trying to build a web space where ideas are synthesized and placed in unique verbal frames. But some ideas truly speak for themselves. Pattie Maes & Pranav Mistry: Unveiling the "Sixth Sense"
This type of interface design reminds me of a previous post where we discuss another TED talk in which Blaise Aguera y Arcas explains the attachment process and how social networks will enrich the physical information surrounding any object in a person's visual field. The iPhone has a free application called Snaptell where the user can take a picture of any book, CD, or any other branded product with the the phone, analyze it, and, if recognized, the phone tells you where you can purchase it online. From a biological slant I imagine that soon the learning curves for botany, zoology, and even medical students will be almost vertical. Imagine having a eye on your chest that could project as much or as little information you desired about the thing you were looking at. This would be a perfect real world application for E.O. Wilson's brainchild - The Encyclopedia of Life or EOL. Imagine approching the bark of on oak tree and having the taxonomic history projected in front of you, or catching a glimpse of a rare bird like the ivory billed woodpecker and automatically reporting your observations including location to a database. In this future we are all reporters, scientists, and most importantly learners. 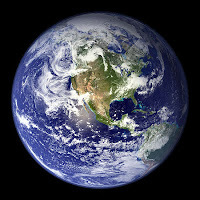 The idea that Earth's biosphere operates cooperatively as a singular superorganism (also known as Gaia theory) has gained footing as more than just a new age worldview since its formation by James Lovelock and Lynn Margulis in the late 1960's. With the publication of James Lovelock's book Gaia - a New Look at Life on Earth the idea that life would go on with or without humanity began trickling into general consciousness. Forty years later Lovelock is not optimistic about the future of humanity in the face of inevitable global climate change. A year ago he was quoted in the Guardian as believing that "global warming is now irreversible, and that nothing can prevent large parts of the planet becoming too hot to inhabit, or sinking underwater, resulting in mass migration, famine and epidemics." He highly doubts the efficacy of green initiatives saying it is really all too little too late. When we go to the grocery store on our bikes and fill up reusable grocery bags with organic veggies are we simply rearranging the deck chairs on the titanic? No one who has made these life changes wants to concede that. But at least we have new leadership that might steer us away from the iceberg. If the desire to make small lifestyle changes spreads to a large enough scale perhaps some environmental mitigation will manifest. In the meantime it might be worth investing in planning "cities of the future" so we might have rafts of survival when southwest Asia runs out of glacial melt water and the Mediterranean gets flooded by Greenland falling into the north Atlantic. Maybe all the houses left empty by the financial meltdown can be left vacant and be readied for the billion plus climate refugees that might be displaced in the near future. In the face of inevitable catastrophe James Lovelock tells a reporter to "Enjoy life while you can. Because if you're lucky it's going to be 20 years before it hits the fan." Cheers to that! We all need to eat drink and be merry regardless of the negative drivel that oozes from the television screen. What do you think about Lovelock's outlook? For the sake of making the hidden abundance of energy on earth more widely known we present a part of the popular film Zeitgeist addendum. Disclaimer. Admittedly the Zeitgeist films feel like left wing propaganda but there seem to be some valid points embedded within a cloud of preachyness. Lighting a 60 Watt bulb for 1 hour uses 216,000 Joules. One zetaJoule is 1,000,000,000,000,000,000,000 Joules. this amount of energy could light one 60 Watt bulb for every human on earth continuously for 79 years. "The reason congress was so quick to bailout AIG was that the pension funds of all congress members were covered by AIG." I found this rumor to be flat out FALSE. Read more here and here. Just to be clear. The pension plans of congresspeople are not insured by AIG or any other company for that matter. The epiphany I had was in response to an action I witnessed as a direct result of this. A statement need not be true in order to have profound effects. The person from whom I heard this rumor proceeded to inform me that he had just purchased 16,000 shares of AIG stock! His faith in the long term survival of AIG had been reaffirmed. Though this bit of knowledge was in fact false it was powerful enough to spur one man to shift thousands of dollars in an instant. Imagine these results multiplied by the number of minds deceived by countless circulating e-mails. The spreading of a rumor often outpaces the correcting force of investigative journalism. Both must be as fast as the speed of light these days. Perhaps this false understanding of reality is beneficial. Perhaps AIG will be saved by an influx of money by wealthy people fooled by the above assertion. In many ways this case makes an argument for the survival of religious mythologies. If the story of a God and his son be true or not whether it be the Christian father and Jesus or Odin and Thor it does not really matter. As long as the telling of the story moves real people to positive action then survival of the mythology makes sense. The problem arises when society attempts to qualify "positive action." This is a question presented anew to each living generation. The choice made by the investor described above puts the entire financial meltdown in perspective. Any intangible financial device is made up of "make-believe" value. When it comes down to real value there are precious few items that truly make up a person's worth. To me these are health, education, and attitude. These are the qualities that lift and let down civilizations. If you would like control over where your tax dollars flow here is an idea I had. "It was the second year of the French Republic. A penetrating dampness from the North Sea blew into Luxembourg in January 1794. The old man with long stringy white hair leaned his emaciated body over the scarred wooden desk..."
Larry J. Frank of Knoxville, Tennessee begins an elegant summary of the life of Thomas Paine. Read the entire piece here. A point made is the fate of Tom Paine's bones, literally scattered to the four corners of the globe. A walking revolution, his bones, like his words, still float among the living inspiring us to maintain our own minds as sacred temples. Recent research from the psychology department at the State University of New York at Fredonia reveals that students who "attend" lectures by watching recorded podcasts gain higher exam scores than those who attend physically. This has been a shock to the professing community and brought the national spotlight to the lead researcher - Dr. Dani McKinney. The research was recently discussed in New Scientist. Having experienced the benefits of recorded lectures first hand, the results of this experiment are not surprising. Not only can a student rewind and repeat key portion of the lectures but the ability to pause and bring up research articles or other background information allows a pupil to come up to speed on a topic before resuming the talking head in front of them. I would argue that a student observing a podcast lecture spends more time engaged in learning than a yawning coffee corpse waiting for the caffeine to take hold. The scientific method needs to be more rigorously applied and the results repeated, but I believe Dr. McKinney is planning follow up large scale experiments. This finding is the seed of what could be a revolution in collegiate information transfer. As a student and teacher of biochemistry I have often mused at innovative ways to transfer knowledge of protein architecture and function. I envision the classrooms of the future to hold large interactive holographic displays. A professor might guide an interactive tour of the cell while he/she explains the catalytic triad and the students are able to manipulate the structure while their classmates watch. For children I would suggest a Nerf version of amino acid building blocks having magnets embedded in the foam to illustrate hydrogen bonds. A group of graduate students and I have been visiting a local elementary school to teach them about genetics and enzymes. At first I was skeptical of how much they would actually "get" but to my surprise they "got" a lot more than I thought. With the advent of recorded lecture series there is no reason real science education could not start much early in the public education system of United States. OK, which one of these guys came up with that name? Next they'll be "the four horsemen - men in tights"
Anyway, I couldn't help posting this mainly because of two new YouTube features - one - the colored border and - two - the HD button - you can watch it in high definition! Vimeo is cool but I knew YouTube wouldn't be that far behind. Within the first two minutes of this video I was reminded that the UN is considering a resolution banning blasphemy. Talk about the religious folks playing the "hurt feelings card." Now it will be illegal in the eyes of the UN to question any religion's authority anywhere in the world. In the spirit of Albuquerque's own Felix Wurman I'd like to begin a weekly celebration of art - the Sunday Celebration. We have done this once before but we would like to make this a regular event. The following piece entitled PERIPETICS is one of 20 incredibly creative videos displayed here by Smashing Magazine. These six dynamic sculptures were created by Zeitguised for the "opening exhibition at the Zirkel Gallery. It entails six imaginations of disoriented systems that take a catastrophic turn, including the evolution of educational plant-body-machine models and liquid building materials.” The seamless use of graphics and sound enhances the already entrancing spectacle. Religion is stale and rigid, life is not. Cheerio my brethren! It is I, Dr. Reverend Lucius Chewbuculus, descendant of an ancient lineage of hairy creatures, who seeks peaceful progression by way of the warrior spirit of pre-colonial American antiquity. I hath come across an atheist blog post listing 101 quotes with regard to atheism or religion in general. Here I list and expand upon several quotes that stand out to me. Check out the link above to view all 101 quotes should this sort of thing suit your fancy. First I would like to point to a few quotes that made me laugh. While I don’t necessarily believe in the magic of fairies, I certainly believe in the magic of laughter. What magic is this? It is impossible to say at this time, however reliable sources in my head say laughter amplifies and reverberates ones Chi, thus realigning the liquid crystalline structure of water in our cells thereby reducing the stress associated with stale rigidity. Laughter is clearly a complicated matter, so you’ll have to just trust me on this. I’ve seen mystical occurrences in the desert, so I am practically a prophet. Perhaps some or none of these quotes strike you as funny. No problem, I actually laughed at some and then cried a little. While I don’t necessarily believe in challenging all elves I should encounter at a crossroads to a dueling of swords, I do believe in the power of tears! Nothing in the physical universal is stable or static, this is especially true of life. Actually these conditions exhibit robust inhibitory effects on life. Our cells terminate at lipid structures that crash upon other cells and extracellular matrix and then recede, continually, much like the waves of the ocean. Just as the gravitational force of the moon impacts ocean swells, prophetic insight tells me that the cohesive forces of our tears induce dynamic fluidity of our cell membranes counteracting the stress associated with stale rigidity. Many aspects of “religion” are stale, rigid and detrimental to inhabitants of earth. Laughter and tears can attest. The division of people into distinctly characterized sects, the installation of fear and manipulation by it, the intolerance of differences… just to name a few. These stale and rigid aspects of religion stand against life and unity! Religion as we know it is obsolete! I will however concede that many elements of “religion” are conducive to life and unity, such as the elements of “open” community gatherings that encourage interaction and celebration. While I would warn the “religious” to be wary of passing though life without questioning their beliefs and perspectives, I would warn atheists against the same. Perhaps “religion” doesn’t need to be abandoned altogether, just transfomed in a massive evolution towards a new age of enlightenment on earth. A progression that seeks to cultivate and harness free thought, to respect reason and diversity and to unite rather than divide. VIVA LA TOM PAINE’S GHOST! 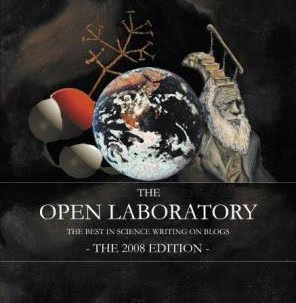 Open Lab 2008 now in print! At first I was skeptical of the validity of this competition thinking it might be like those "poetry anthologies" anyone taking a high school English class is solicited to submit to, but I now realize that openlab is a legitimate competition displaying the best science writing out there. Entries from some of my favorite blogs like Panda's Thumb, and not exactly rocket science have been selected in the past. There was even a shout out to the openlab competition in Discover Magazine on page 20 of the March 2009 issue. 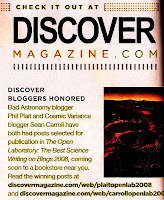 Along with us, two professional science writers for Discover were honored among the top 50 science posts for 2008 in openlab. Participation in this process has been truly rewarding, introducing TPG to a broad range of creative minds and new ideas. Read our entry here. I encourage anyone reading this to consider participating in our own competition the theme of which is not relegated to scientific musings but is a challenge to integrate multiple forms of media into a flowing and coherent thought. On top of some cash you may even earn some new dendritic morphology. Thomas Paine came to America largely through his connection to Benjamin Franklin. Franklin provided Paine a critical letter of introduction which Paine presented in Philadelphia upon his arrival in 1774. The stories of these founders are tightly woven and many works attributed to one or the other may have been the result of conversations between the two. While Paine was the son of a staymaker (one who crafts corsets), Franklin was the son of a candle and soap maker. 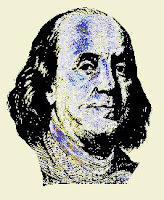 But the threads of their philosophical connection coalesce further as Franklin's ancestry is uncovered by modern historians. The Belgian paper Flanders Today reveals Franklin's ancestors were of Belgian (more specifically Flemish) descent. Franklin's DNA meandered to America from Flanders by way of England’s second largest city at the time - Norwich. This city is situated close to the North Sea and a "historic hotbed of religious dissent." The city was flooded with Flemish emigrants in the 1560s - mostly protestant weavers. They were fleeing persecution by a Spanish duke. Among these sartorial religious refugees were Benjamin Franklin's maternal great-great-grandparents. Though his grandfather Peter died 16 years before his birth, Franklin's writings reflect how he came to embody the "decent plainness and manly freedom" exemplified by his grandfather. The connection between clothes making and the ancestral trade of Franklin and Paine is more than serendipitous. Perhaps during the post-Renaissance middle class outgrowth crafting cloths for common people bound makers to their market and helped foster the memetic roots that would eventually rip arbitrary authority from the throne of England and place it squarely in the hands of the people. It might do the America of 2009 some good to once again start making clothes and furniture and all the myriad consumables that constitute CULTURE. Bozeman, Montana is one of those places I visited through the pages of a book before being there physically. 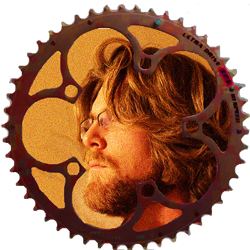 I walked through the campus of Montana State University in my mind's eye while reading Zen and the Art of Motorcycle Maintenance which would become the first book along my travels down the rabbit hole of heady material. For those who have read it Robert Pirsig's descriptions of this collegiate mountain town give the place an electric but dissonant feel. It was here the author began his personal demolition into a being of more than one simultaneous opinion. Today there was an explosion in the real Bozeman. It is not clear at this point what the cause of this conflagration was but the video seen below scares me. This was recorded only a few blocks away from the incident only a few months ago. I am not claiming these are the culprits but merely suggesting that the alibis of this group be collected and assessed. Displayed here is exactly the type of deleterious reprogramming the human brain can undergo; fervent righteousness - the enemy of reason - certainty. PZ Myers on his blog Pharyngula describes this phenomenon in more detail while discussing points made by Richard Dawkins at a recent lecture. "He talked quite a bit about the flexibility of the human brain, a property that was the product of selection, yet that same flexibility means it can be reprogrammed into deleterious byways, such as religion or fanaticism or unthinking patriotism." I truly believe the most effective way to battle fanatically driven domestic terrorism (Waco, Oklahoma city, 9/11 etc. etc.) is not by building bigger prisons but by building larger libraries, and larger universities. Regardless if this incident was accidental or intentional may the families affected by the explosion find solace in knowing that people all around the world are thinking about them and wishing that they do not suffer. ...I heard about this story on Twitter and though some may call this new form of media silly I think it the ultimate bypass of the corporate gatekeepers. "The greatest threat to our democratic experiment will not come from those who would openly oppose us, but those who will silently follow us." An excellent site to reacquaint ourselves with the LIVING American genome. USA Today has announced that humanists are happy about the recent supreme court decision regarding free speech. I consider myself a humanist yet I am not so happy about it. The supreme court in essence ruled that a city government can decide which religious monuments to allow in public places. 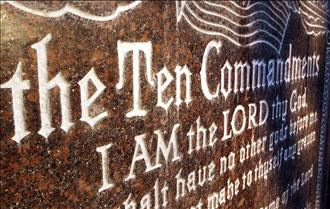 The issue at the center of this case began when a small religious group in Pleasant Grove, Utah known as the Summum church requested that the city display a three foot granite slab outlining its core principles, the "Seven Aphorisms" next to a monument listing the Ten Commandments that has stood on this public park since it was donated by eagle scouts in 1971. I have posted about this case before and you can find all the quarks surrounding this religion described in detail here. The problem with the supreme court decision is that it allows city governments to choose which religions are allowed to mark up public places. In my mind when one religion is allowed to display their beliefs carved in stone then that automatically makes the surrounding space a public forum and therefore any person or peaceably assembled group of people have the right to place their words in that public forum as well. "In the case of the Summon religion and their granite slab I feel like the only fair thing to do is tell the city of Pleasant Grove to either remove all religious writings from the public land or allow those tasteful and aesthetically pleasing views of other religions to be erected as monuments of equal size and equal real estate value. The city still has the right to refuse in this instance but has to be an equal opportunity censor."